Young men playing basketball at Highwood Park one afternoon in late August. A "gangsta" invasion or just some guys playing pickup games after work? Settling in 17th-century Fairfield was not unlike applying for membership to a private club -- only tougher. Outsiders were viewed with suspicion until they had undergone a thorough vetting of their moral sufficiency at a town meeting made up of the few dozen established families. Even then, town constables closely monitored the behavior of townspeople, and "strangers" visiting or traveling through were considered troublemakers until proven otherwise, which was typically never. Nowadays, the RTM doesn't vote on your piety before you can buy a house. People can move about town and use public facilities without regard to their legal address. Over the centuries, Fairfield has shed its Puritan xenophobia. Or has it? 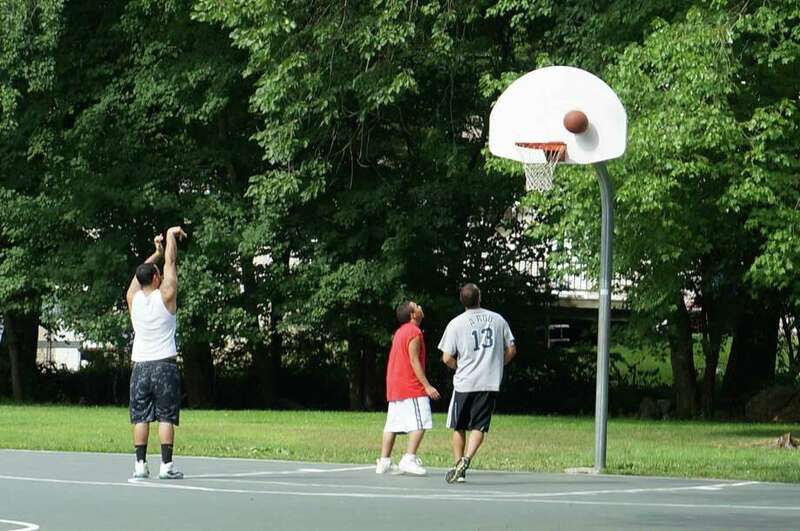 As reported recently in these pages, a complaint has been brought to the Parks and Recreation Commission about the sort of people who have been showing up to play basketball at Highwood Park, a nifty little recreational oasis in a tidy neighborhood north of Fairfield Woods Road. A resident down the street from the park strongly suspects that they come from out of town, and look for all the world like gang members. With all their reckless driving, trash-talk, and littering, he said, you've got a neighborhood too intimidated to use the park. A solution was proposed -- simply take down the hoops so that the undesirables will, as it was put, go back to wherever they came from. Terrified neighbors can then emerge from their homes and once again enjoy their park, except of course for basketball. The commission balked at the idea. A gang invasion of Highwood Park? Over the past few weeks, I've made many visits there, on different days and at different times (easy for me, I'm retired), hoping to spot the hoodlum hoopsters. In the process, I've been able to speak with several people from the neighborhood. A bright green sign at the Palamar Drive entrance commemorates a 1998 renovation by the town and a local grassroots nonprofit, Safe Parks and Recreation for Kids, or SPARK. The Kiwanis Club and the Junior Women's Club were major sponsors, but neighborhood volunteers chipped in with contributions and labor. A rusting eyesore was transformed into a well-groomed little baseball field, an inviting playground, and an adjoining green space. For its part, the town remade the deteriorating basketball court into a playground jewel. With its flawless, well-marked surface, sturdy backboards, and baskets complete with nets, this court would have been Nirvana in my New York City neighborhood. This summer, though, the court has been discovered by the aforementioned "thugs," as another resident referred to them. He assured me that you just have to look at them to know they're not from around here. But not everyone in the neighborhood feels the same way. One woman, who frequently walks her dog past the park, said that her biggest problem was all the cars parked on the street during Little League games. She has sometimes seen parents speed to games or leave litter behind. She is very familiar with the basketball scene, and has never felt intimidated. "It's a basketball game," she said. Other neighbors, volunteers on the 1998 project, reported that their son, now in college, regularly plays in Highwood Park pickup games with whoever was there to play. The family was startled by a neighbor's description of the players in the Citizen article. A mother who brings her two young sons to Highwood from a different neighborhood says she feels safer when there's a basketball game going on. On recent weekends, Highwood buzzed with Little League games. Parking is clearly a problem, but inside, the scene was lively and relaxed, with other kids taking advantage of the playground, shooting baskets or kicking a soccer ball. At other times, people of all ages showed no fear of entering the park. Kids come down to have a catch or shoot baskets; grandparents take grandchildren to the playground; mothers with strollers pass through; people walk their dogs (despite the "No Dogs Allowed" sign at the entrance). Aha, but what happens when The Thugs From Wherever They Come From descend upon the park? Late one afternoon, this very event took place. There they were -- eight twenty-something males, choosing up sides, thuggishly dressed in sneakers, shorts, and T-shirts. I sat down on a nearby bench to observe. Were these thugs THE thugs? Affirmative. I asked one of them getting a drink at the water fountain if this was a regular game, and he said yes, they'd been coming down after work all summer. I did not ask him where they all lived, because it was none of my business. What I saw was eight guys playing a typical playground half-court game: Casual defense, a hail of 3-pointers and aggressive rebounding. Bad language? Affirmative. But less than I expected, and if you weren't courtside you wouldn't have heard it. Litter? Negative. Meanwhile, younger kids shot baskets at the other end of the court, and more kids arrived to join them. A dozen Little Leaguers showed up for a practice. A mother with a stroller ambled by. No one present seemed to be concerned about the gangsta-ball right there on the basketball court. Is it possible that these guys have at some time misbehaved beyond playing basketball? Sure. Disruptive or unlawful behavior by anyone in Highwood Park should be reported to the police, as it has. But the police have found no violations in responding to calls from residents or during routine patrols. Long live gangsta-ball. And leave the hoops up so everyone can play. Ron Blumenfeld is a Fairfield writer and retired pediatrician. His "Moving Forward, Looking Back" appears every other Friday. He can be reached at: rblumen2@gmail.com.